January 11, 2016 – The National Center for Atmospheric Research (NCAR) announced today that it has selected its next supercomputer for advancing atmospheric and Earth science, following a competitive open procurement process. The new machine will help scientists lay the groundwork for improved predictions of a range of phenomena, from hour-by-hour risks associated with thunderstorm outbreaks to the timing of the 11-year solar cycle and its potential impacts on GPS and other sensitive technologies. The new system, named Cheyenne, will be installed this year at the NCAR-Wyoming Supercomputing Center (NWSC) and become operational at the beginning of 2017. Cheyenne will be built by Silicon Graphics International Corp. (SGI) in conjunction with centralized file system and data storage components provided by DataDirect Networks (DDN). The SGI high-performance computer will be a 5.34-petaflop system, meaning it can carry out 5.34 quadrillion calculations per second. It will be capable of more than 2.5 times the amount of scientific computing performed by Yellowstone, the current NCAR supercomputer. Funded by the National Science Foundation and the state of Wyoming through an appropriation to the University of Wyoming, Cheyenne will be a critical tool for researchers across the country studying climate change, severe weather, geomagnetic storms, seismic activity, air quality, wildfires, and other important geoscience topics. Since the supercomputing facility in Wyoming opened its doors in 2012, more than 2,200 scientists from more than 300 universities and federal labs have used its resources. The NWSC is located in Cheyenne, and the name of the new system was chosen to honor the support that it has received from the people of that city. It also commemorates the upcoming 150th anniversary of the city, which was founded in 1867 and named for the American Indian Cheyenne nation. The new data storage system for Cheyenne will be integrated with NCAR’s existing GLADE file system. The DDN storage will provide an initial capacity of 20 petabytes, expandable to 40 petabytes with the addition of extra drives. This, combined with the current 16 petabytes of GLADE, will total 36 petabytes of high-speed storage. The new DDN system also will transfer data at the rate of 200 gigabytes per second, which is more than twice as fast as the current file system’s rate of 90 gigabytes per second. The system will include powerful Intel Xeon processors, whose performance will be augmented through optimization work that has been done by NCAR and the University of Colorado Boulder. NCAR and the university performed this work through their participation in the Intel Parallel Computing Centers program. Even with its increased power, Cheyenne will be three times more energy efficient (in floating point operations per second, or flops, per watt) than Yellowstone, its predecessor, which is itself highly efficient. “The new system will have a peak computation rate of over 3 billion calculations per second for every watt of power consumed,” said NCAR’s Irfan Elahi, project manager of Cheyenne and section manager for high-end supercomputing services. High-performance computers such as Cheyenne allow researchers to run increasingly detailed models that simulate complex processes and how they might unfold in the future. These predictions give resource managers and policy experts valuable information for planning ahead and mitigating risk. Streamflow. Year-ahead predictions of streamflows and associated reservoir levels at a greater level of detail will provide water managers, farmers, and other decision makers with vital information about likely water availability and the potential for drought or flood impacts. Severe weather. By conducting multiple simultaneous runs (or ensembles) of high-resolution forecast models, scientists will lay the groundwork for more specific predictions of severe weather events, such as the probability that a cluster of intense thunderstorms with the risk of hail or flooding will strike a county at a particular hour. Solar energy. Specialized models of solar irradiance and cloud cover will be run more frequently and at higher resolution, producing research that will help utilities predict how much energy will be generated by major solar arrays hours to days in advance. Regional climate change. Scientists will conduct multiple simulations with detailed climate models, predicting how particular regions around the world will experience changing patterns of precipitation and temperature, along with potential impacts from sea level rise, streamflow, and runoff. Decadal prediction. Ensembles of detailed climate models will also help scientists predict the likelihood of certain climate patterns over a 10-year period, such as the risk of drought for a certain region or changes in Arctic sea ice extent. Air quality. Scientists will be able to simulate the movement and evolution of air pollutants in far more detail, thereby better understanding the potential health effects of particular types of emissions and working toward improved forecasts of air quality. Subsurface flows. 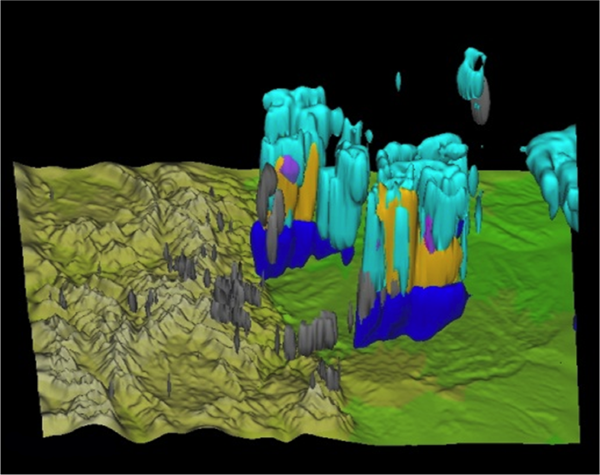 More accurate and detailed models will enable researchers to better simulate the subsurface flows of water, oil, and gas, leading to a greater understanding of these resources. Solar storms. Innovative, three-dimensional models of the Sun will lay the groundwork for predictions of the timing and strength of the Sun’s 11-year cycle as well as for days-ahead forecasts of solar disturbances that can generate geomagnetic storms in Earth’s upper atmosphere.